I was reading today about the sweet Renaissance Reformer, Philip Melanchthon. As much as Luther, he is the primary founder of Lutheranism. 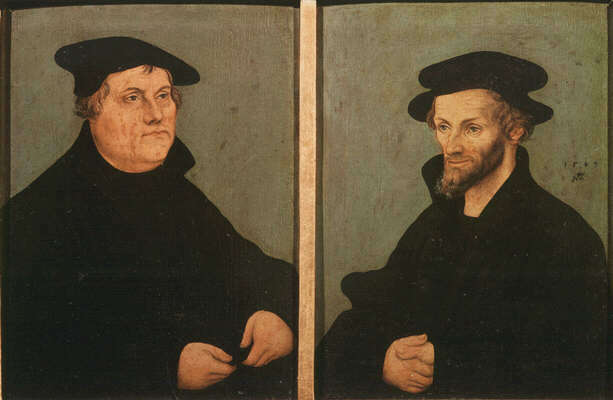 Melanchthon made the distinction between law and gospel central. By the “law” he meant the Papacy and rigid rituals controlled by priests; the “gospel” meant an individual directly confronting Christ through Bible reading, hymns and prayer. Urged to marry (the daughter of the Mayor of Wittenberg) by Luther, (no doubt, partly to cement his ties to Wittenberg), he proved a loving husband and father. His domestic life was happy. He called his home “a little church of God,” always found peace there, and showed a tender solicitude for his wife and children. To his great astonishment, a French scholar found him rocking the cradle with one hand, and holding a book in the other. Melanchthon was dwarfish, misshapen, and physically weak, although he is said to have had a bright and sparkling eye, which kept its color till the day of his death. He was never in perfectly sound health, and managed to perform as much work as he did only by reason of the extraordinary regularity of his habits and his great temperance. And here he is, with Martin Luther. Whom would you rather be friends with?